Curcumin is a flavonoid extract of turmeric root but it is poorly absorbed in the body and rapidly metabolised into inactive forms. Longvida Optimised Curcumin harnesses a patented lipid delivery technology that offers 285x greater bioavailability, 65x higher peak plasma levels, and 7x longer-lasting action than standard curcumin. 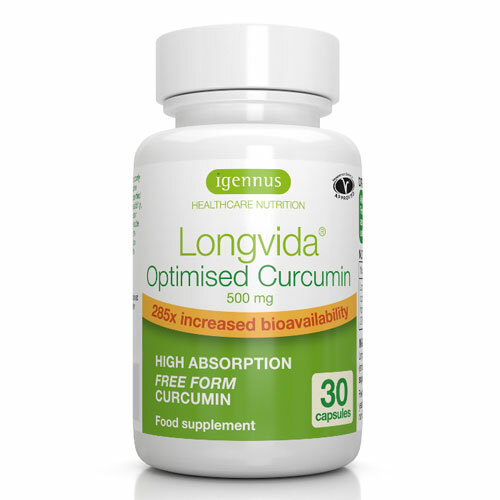 Longvida curcumin is highly stable and highly soluble, optimised to deliver free curcumin (the active form that is not metabolised or glucuronidated) into the bloodstream and target tissues. Free curcumin is the only form that is proven to reach the brain. GMP manufactured - quality standards that medicines manufacturers must meet in their production processes to ensure products are of consistent high quality. Longvida optimised curcumin extract; capsule shell (emulsifier: hydroxypropyl methylcellulose); stearic acid; soy lecithin; maltodextrin; ascorbyl palmitate; silicon dioxide. Adults: take 1 capsule daily with food. For intensive support, take 2 capsules daily as a split dose. Do not exceed the dose unless advised by a healthcare practitioner. Seek professional advice before taking any food supplement if you are taking medication or breastfeeding. Below are reviews of Igennus Longvida Optimised Curcumin - 30 Capsules by bodykind customers. If you have tried this product we'd love to hear what you think so please leave a review. I tested this product because of the claims. Igennus product is better than others because is free form and it has more potency. This is now my go to tumeric product. Studies support the claims and I have found it to have excellent results. Longvida Optimised Curcumin harnesses a patented lipid delivery technology that offers 285x greater bioavailability, 65x higher peak plasma levels, and 7x longer-lasting action than standard curcumin.